Mohs surgery, named after a general surgeon who developed the advanced micrographic surgery technique in 1938, is a procedure that carefully and precisely removes skin cancer. The goal of the procedure is to remove as little normal skin as possible while still maintaining the highest success rate for skin cancer treatment. It is used to treat squamous and basal cell carcinomas, melanomas and certain types of other less common tumors. 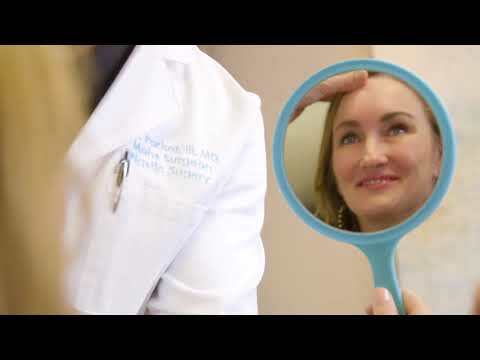 Board certified in plastic surgery and dual trained in Mohs surgery and procedural dermatology, Dr. Thornwell Parker will begin this procedure by removing the tumor one layer at a time. After each and every layer, he will examine the cellular makeup of the tissue to determine if cancer remains. Dr. Parker founded Skin Cancer Consultants in Dallas, TX with the mission of providing outstanding treatment and impactful aesthetic outcomes. "I needed MOHS surgery on my face. Dr. Parker was referred to me by my dermatologist. He has a nice bedside manner and explained all the details to me. He performed the surgery and now the scar is fading/blending into my face. I would recommend him to my family and friends. He and his staff are very friendly, knowledgeable and patient." The Mohs procedure typically utilizes local anesthetics to numb the affected area. Incisions are made just outside the visible edges of the cancer to start removal, and a map similar to a clock face is created to correspond with the orientation of the skin that was removed. The removed layer is frozen, processed, and examined under the microscope. If additional cancer roots are seen they are marked on the corresponding map and the process is repeated, excising another layer from the areas marked on the map. The process continues until a clean layer with no remaining cancer is achieved. The number of layers removed and the length of the procedure is dependent upon each patient, the stage of the cancer, and the length of time the cancer has been present. Completion of the procedure will leave a wound. Healing solutions range from simple sutures to close the wound to more complex reconstructive (plastic) surgery for larger wounds. This will be guided by Dr. Parker. View more information about intervention here. A Mohs procedure is not a simple proposition. It requires a highly trained and well-oiled team to properly administer all aspects — from the surgical removal to the to the microscope pathology to the plastic surgery. Dr. Parker himself is one of only seven doctors in the world who is not only fellowship trained in Mohs surgery, but also a board-certified plastic surgeon. With the proper amount anesthesia, most patients report a minimum amount of pain. Mohs surgery is usually performed on an outpatient basis, and after patients can drive themselves home or are taken home by a loved one. Dr. Parker is an expert in restorative facial surgery. Although the site is heavily bandaged, it is possible to resume routine non-strenuous activities the next day. This rules out strenuous exercise or heavy activities for up to 1 – 2 weeks. If sutures were utilized, they will be removed within 6 – 14 days. 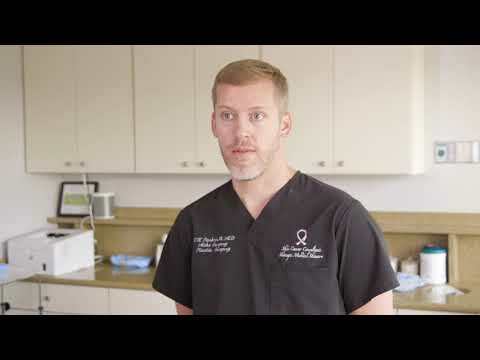 Dr. Parker’s skill with suturing minimizes scarring but will vary depending on the procedure. However, the success rate of removing the cancerous tissue from the site is very high with primary basal cell carcinoma and thin melanomaas receiving up to a 99% rate. Primary squamous cell carcinoma has a slightly lower cure rate around 97%. When facing a skin cancer diagnosis, it is imperative to do your research and find a trained Mohs surgeon like Dr. Parker, who is a good fit for meeting your expectations and needs. Success rates of the procedure are directly correlated to the doctor’s skill and experience. So be sure to ask your doctor questions pertaining to their experience, training, and personal success rates. Ideally, you and your doctor will be able to strategize the most effective way forward. An excellent place to start would be to call Dr. Parker now and simply schedule a consultation to talk about options for treatment, risks, outcomes, and post-surgical care.